If you are both a Francophile and a golfer, the ultimate dream must be to own a property on one of France's excellent golf courses. Imagine waking up every day to see the sun streaming in through your window, and to open that window and look out onto the velvet green of a superb course, set perhaps near the Mediterranean, close to the stunning scenery of the Alps (Alps property), or in any part of this glorious and diverse country we know as La Belle France. Not many of us are wealthy enough to own our own course, but these days the prospect of buying property situated on a French golf course is a very realistic dream. France may have been a little behind countries such as Spain and Portugal in cottoning onto the massive popularity of the sport, but she is making up for lost time, and excellently designed courses are springing up in exquisitely beautiful areas all over the country. From the sunshine regions of the Med to the green heartlands of central France, from the links courses of the Atlantic coast to the foothills of the mighty mountains, golf courses have arrived in France! Why buy property on a golf development? A golf development is specifically built to provide attractive, high quality housing on or around a golf course. It is the next best thing to owning your own course, and you have the guarantee of a certain exclusivity, of uncrowded fairways allowing maximum enjoyment of the game. Such is the popularity of the sport that not only is a property like this a great investment for your own pleasure, but also offers good potential for bringing in a rental income should you wish to avail yourself of this option to offset some of the costs of purchase and maintenance. Many who have bought gites to let out for holidays are struggling to fill them, as such a number of people have jumped on the bandwagon and supply, quite simply, is outstripping demand (Owning Gites and Chambres D'Hotes (B&Bs) in France). Not so with golf development properties. Golf continues to grow in popularity, appeals equally to both men and women, is accessible to young and old, and is a healthy sport that can happily be undertaken by whole families. No wonder golfing holidays are popular. Surprisingly, it isn't just golfers who are keen to take their holidays in a property on a golf development, as there are numerous other attractions associated with such properties. They are almost invariably situated in scenic surroundings, providing beauty and tranquillity. Golf developments have a wonderful sociability factor too, with clubhouses, social events and entertainment, shopping facilities and often other sports and leisure activities built in. Of course, if you do happen to be an aficionado of the game, you have the added pleasure of finding yourself living among like minded neighbours, who really won't mind if you want to play and talk golf all the way from the first tee to the 19th hole and back again! Why buy a golf property in France? It is true that France may not be the first country you think of when you consider the great golfing destinations of the world, but the world is changing and it may be time to rethink. It is now universally accepted that France is the proud possessor of some of the finest courses in the world, and more and more are being constructed all over this beautiful country. With such diversity of land and seascapes, a temperate and largely sunny climate (Weather in France), vast open spaces just begging to be turned into golf courses and the French obsession with being the very best in anything they decide to undertake, France is just perfect. Having been slower to catch on to the golf phenomenon, France has the advantage of being able to learn from the mistakes of others, and thus offers well thought out developments with extensive facilities, great locations and the best of quality housing. Spain has some good golf developments, to be sure, but Spanish developers have also been guilty in some cases of shoddy workmanship resulting in poor quality houses, ill designed courses and locations that have been chosen for their affordability and profit potential rather than their accessibility and desirability. No one, however keen a golfer, wants to spend their holidays isolated from anything other than a golf course, and most certainly if they are holidaying with non golfers it is essential that there are other attractions nearby. What type of property is available on golf courses in France? There are many different types of property available for purchase on French golf developments, and most of it is of very good quality. Some are distinctly modern in appearance, while others, although newly built, echo the style and ambience of traditional French homes, with stone façades and painted shutters. You can find detached villas as well as apartment blocks, single storey homes or multi level. Many of the best developments feature houses built in the local style, ensuring a pleasing sense of accord with the region you have chosen. France is a good place to purchase property through the excellent leaseback scheme introduced in 1976 by the French government to enhance property sales in the country. There are some drawbacks to the scheme, so it is not suitable for everyone, (there is usually a time limit on the length of time you can occupy your property during the term of the leaseback) but it can be a useful way to finance your golf property if you are only planning to spend short holidays there. 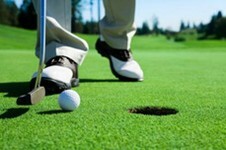 Many golf developments offer leaseback terms. (Leaseback Property in France). Other developments may offer direct sales or a choice between both systems so it is important to consider these options when deciding on which development to choose. Clearly there will be a massive difference in price between different developments, different parts of the country and different styles of property, but as a general rule you should expect to pay perhaps twenty percent more for a property on a golf course than you might pay for a similar home in a village or town. This is because the developer will have had to pay a large amount of money for the land and construction of the course (or the purchase of an existing course), and also because the properties on such developments in France is generally of a high standard. Expect to pay maintenance charges too, in the same way that you would if you bought a holiday home in a seaside holiday apartment complex, with a share of the costs of groundsmen, window cleaners, pool technicians and other necessities. The more facilities your development possesses, the higher will be the maintenance charges, but the benefits outweigh the extra cost for most people. Golf property in France - where should you buy? Normandy (Lower-Normandy Property Guide, Upper-Normandy Property Guide) in the north of France offers some very good golf developments and courses, such as Deauville (Deauville Property Guide), with the advantage of ease of access from the UK. Aquitaine (Aquitaine Property Guide), on the south-west coast is also a very popular location for golfers, particularly for those who enjoy links style courses. Moving across to the south-east there are new golf developments springing up all the time in the Languedoc (Languedoc-Roussillon Property Guide, Languedoc-Roussillon Property - an insider's guide), Provence (Provence-Alpes-Côte d'Azur Property Guide) and the Riviera (French Riviera Property - an insider's guide), all of which have the advantage of a perfect golfing climate. The weather in southern France is generally better for golfers than the often extreme heat of Spain or Portugal, which can make a round of golf as difficult to enjoy as rain and cold. Courses in France are also easier and cheaper to maintain because of the temperate climate, keeping green fees reasonable. France is a large and diverse country, giving you plenty of options for the ideal golfing location to suit your individual needs. A development may be situated in the countryside, giving tranquillity and natural beauty, or near to a buzzing atmosphere of a city or seaside resort. It may be set in a richly historical area, for example, the Languedoc, or in an area with many theme parks and entertainment such as Poitou-Charentes (Poitou-Charentes Property Guide), thus allowing for interesting days out for non golfers and improving the letting potential. Careful consideration of all the options before purchase is important, and it may be a good idea to try before you buy by taking a few holidays in different golf developments before making a final decision where to buy, or what type of property and terms will be best for you. 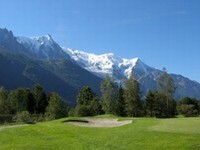 Golf property in France - a golfing heaven? There may or may not be such a thing as heaven on earth, but if you are a keen golfer then owning a property on one of France's excellent courses must come close!